The Red Feedsack: My Pantries And The Magazine Winners! My Pantries And The Magazine Winners! My daughter wrote a blog post earlier this week about the magazine that she and I contributed to. In her blog post she had a picture of my kitchen pantry and mentioned how she styled it for the magazine. (The picture above is the one my daughter took for the magazine and we moved all my usual stuff out and put the home canned things in.) I had numerous emails about it as well as a few comments about it on her blog. I went back to my kitchen post and realized that somehow I missed talking about this little pantry. It is located in a very neat place, basically it is part of the refrigerator cabinet. I do not take credit for this. Nancy, at the cabinet shop, suggested it to me when I was going over my kitchen design with her, and it is just the greatest cabinet. In the above picture it is the cabinet on the left side of the refrigerator cabinet. It takes up very little room but yet it holds an amazing amount of items. My daughter said if it was hers she would take the doors off and display all her canned goods. I do like that idea, as I love the dark stain on the beadboard backing. However, I have another pantry in my laundry room (two steps away!) that has the screen door and it is the place I actually designed for my canned goods. So this little pantry ends up being the perfect spot for any canned goods I actually buy (which aren't many) and other items that won't look pretty in my other pantry. It is not a deep pantry at all, but it is actually pretty amazing what it can hold. I do buy a few canned things in bulk from Costco and it all fits in here perfectly. The shelves are adjustable of course so I could easily change them to hold taller things like cereal boxes. I use the very top cabinet for things I don't need frequently as it is pretty high and rather inconvenient for frequently used items. It is a great pantry that is so convenient but uses space that would otherwise be wasted. I recommend one of these cabinets to everyone! Then there is my large pantry in the laundry room that I believe I told you a little bit about here. Eldon custom built it to what I had wanted. Including the screen door! It has deep shelves for my graniteware canning pots, pressure canner, and my large strainer and pestle. I can put these items on my top shelf where I don't need to get to them that frequently. I've also ended up using this pantry for my dry bulk items that I buy at Costco. I like to transfer things to glass jars that are labeled with chalkboard labels. The bottom of the cabinet is great for my large bins for paper towels, coffee pods, and my potato and onion bin. So many people have said to me that they could never have a pantry with a screen door and in such a visible place (you can actually see it from my living room!). However, I have found that I love it because it forces me to keep it organized and neat and tidy. I feel like the layout of it really helps to keep it from getting cluttered too. Plus, it actually goes with my farmhouse decor so that makes it actually just blend in! Now for the winners of the two magazines. Honestly, I wish I had a free one to send to everybody. Kathleen and Emily are the winners. I've notified both of you via email! Congratulations! The magazine is in most stores where magazines are sold. I saw it in our local Walmart this week, I'm sure Barnes and Noble carries it and someone told me they got theirs at Tractor Supply. Hope you had a very good week. We've been watching for a calf to be born to Old Red. I have a little friend, she's ten, that has begged to be here to see a calf born so we were really hoping that Old Red would cooperate and have her calf during the day. Nope! She had it finally this week - in the middle of the night. And that very morning, she brought her to meet me at the garden where I was working! There is nothing sweeter than new calves! P.S. Thank you to all my readers who comment on my blog. It means a lot to me and I love every comment I get. We drove from Huntsville to Franklin today (with a stop in Lynnville on the way home). I don't know where you are exactly in Tennessee, but I thought about your blog and beautiful hom as I gazed at the rolling hills. I will certainly look for a copy of the magazine! My pantry is a mess. You are inspiring me to clean and organize. Your pantry looks great and all the yummy can goods...Wow! 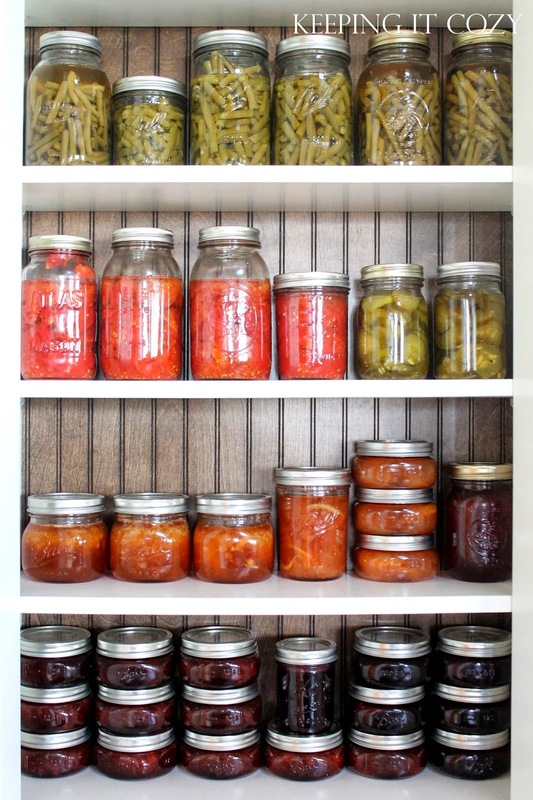 I hope to replenish all my can goods this Summer...Lots of work but well worth it.. Beautiful and neat pantry ideas from your home.. Have a great Sunday! Blessings! Looking at your pantry makes me want to go organize! Thanks so much for sharing. Hello! I'm Dori. Welcome to my blog. This is the place where I share all sorts of things about my creative country life! A Magazine Feature and A Give Away!